1. From the Tools menu, select Copy. The Copy Task dialog box appears. 2. 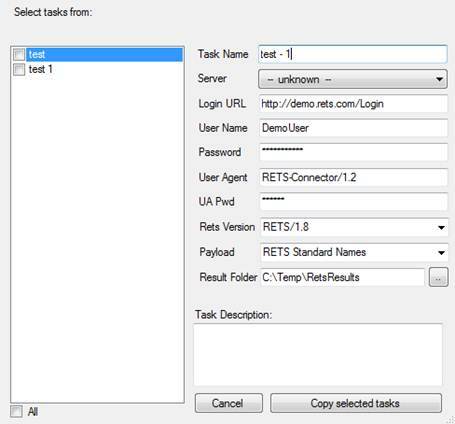 Select the checkbox next to the task(s) you want to copy. 3. Edit the data for the selected task, if desired. 4. If you do not want to use the original task's results folder, specify a new one. • Click the browse button next to the Results Folder box. A Browse for Folder dialog box opens. • Select the folder to use from the dialog box. 5. Repeat steps 2 – 4 for any other task you want to copy. 6. Click the Copy Task or Copy # tasks button.